UV Sanitized was founded by two friends with the mission to improve the health of individuals in our community. By providing access the best UV Sanitization equipment available on the market, we aim to improve the health and well-being of all. UV Sanitized is currently the only company in the Midwest to offer mobile UV service. The reduction of bacteria in any facility has a direct impact on the reduction of healthcare associated infections. We were surprised to find that most hospitals are not able to fund ownership of these powerful machines even though the scientific merits are indisputable. The list of pathogens UV technology reduces or eliminates is extensive and is an immediate benefit to anyone in the treated environment. While the most obvious application for our services is healthcare related, anyone can understand the immediate benefits to the entire community when our public places are cleaner and therefore healthier. Schools, community centers, nursing homes, churches, restaurants and day cares are just the beginning of a formidable list of highly visited public places which could benefit from proper sanitation. We also will improve the lives of many others outside our community by maintaining a higher standard of clean for food production plants and the like. Helping others lead a more healthy and productive life is at the core of our company's mission. To that end, we also set out to make this technology available to the public. People suffering illnesses due to a suppressed immune system, those struggling to stay healthy during chemotherapy or those caring for the ill in their home now have access to state-of-the-art technology to immediately reduce the pathogens in their environment. Whether you have a serious medical condition or simply need your home sanitized to prevent the spread of infection after a temporary illness, we want to deliver the same hospital-grade service. Here in our community our aim is to deliver the new standard of clean - UV Sanitized clean. Recognizing that ultraviolet technology is the key to fighting against dangerous pathogens, our state-of-the-art technology comes to the market based on years of research and development. Launched in 2013, this technology brings to the market a high power Ultraviolet light sanitization system that kills germs on surfaces and in the air. Our sanitization systems are a “green” approach to the elimination pathogens, using high-efficiency, high-output UVC light versus harsh chemicals. The UVC output is high enough to kill many times over what are considered to be some of the most virulent pathogens, including C. diff, MRSA, Staph, Salmonella, HIV, Norovirus and so called superbugs, with just 5 minutes of UVC light exposure at a distance of 15 feet. UVC light is effective in eradicating pathogens and delivers better health for all. Future product development plans include the introduction of a variety of models and performance levels that will enable the effective use of UVC light for sanitization in areas where it was never before considered. At UV Sanitized, we appreciate the power of American-made products. All of our systems are manufactured and assembled in an ISO 9000 facility that meets or exceeds the quality assurance standards. As a Certified Healthcare Environmental Services Professional (CHESP) by the Association for the Healthcare Environment (AHE), Todd is motivated to help patients and residents have a better healthcare experience and improved outcomes. Inspired by his catastrophe response work in the insurance field helping those impacted by Hurricane Katrina, Todd spent years working in healthcare environmental services. 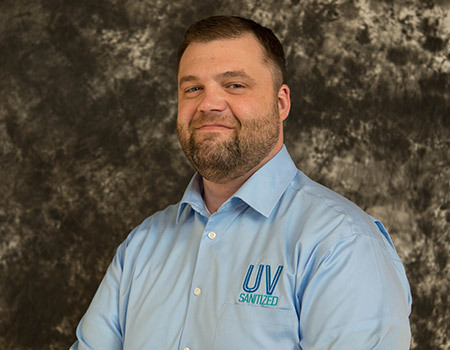 As Co-Owner, Todd serves as the UV Sanitized Director of Operations. As an emerging entrepreneur, Cody creates a connection between helping families and modeling what great business leaders can do for our communities. Cody has dreamt of owning a small business like UV Sanitized, which would serve people and improve their health. With his years of sales experience, Cody's dream of business ownership has come to fruition. 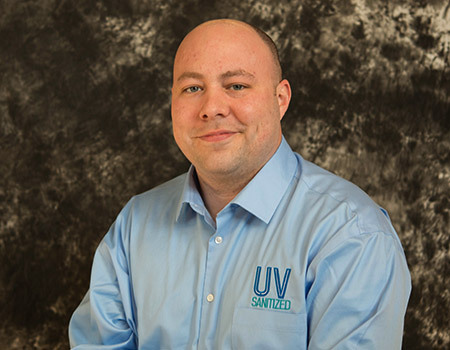 As Co-Owner, Cody serves as the UV Sanitized Director of Business Development. You talk. We listen. We assess risk exposure or emergency needs. Let's take some BEFORE and AFTER samples and let the lab deliver conclusive results. We discuss lab results and customize a schedule to fit your budget and goals.